Rehab is officially CLOSED as of August 2018. 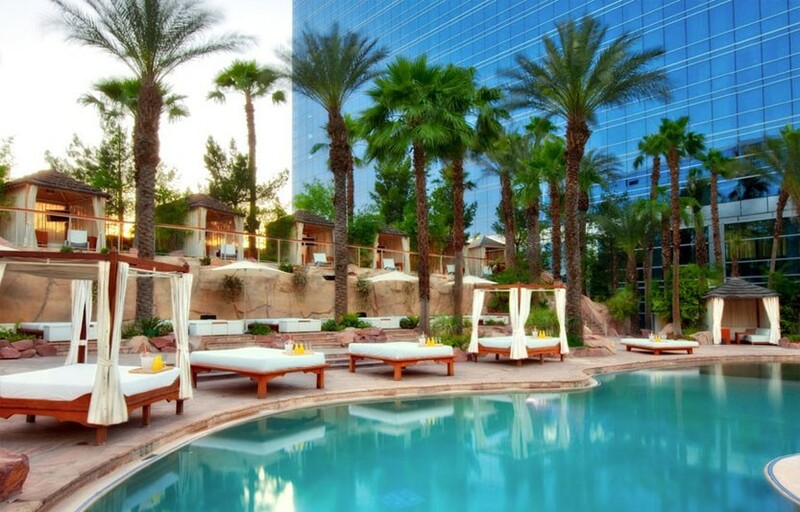 Rehab Las Vegas, located at the Hard Rock Hotel, is the original Vegas pool party. Rehab is the name of the Sunday pool party at the The Hard Rock Hotel Beachclub, a 5 acre tropical playground was selected by the Travel Channel as one of the top 10 pools in the world. 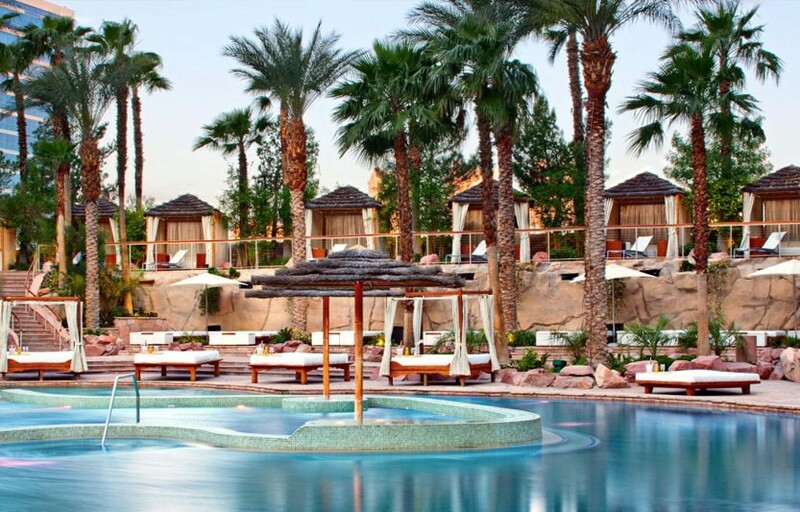 Rehab Las Vegas pool’s Caribbean-blue water and sandy beaches also feature swim up blackjack and luxurious cabanas equipped with private safes, LCD flatscreen televisions, refrigerators, lounge chairs and a personal cabana host to serve you. In the past Rehab has featured guests such as T-pain, Flo Rida, Nelly, Usher, and Chris Brown. Like all pool parties in Las Vegas, Rehab Las Vegas is seasonal, usually starting sometime in March and closing sometime in October. Rehab was the original Vegas pool party – it’s also the best hip hop pool party. Rehab hosts a large variety of live performances. Lets get turnt! 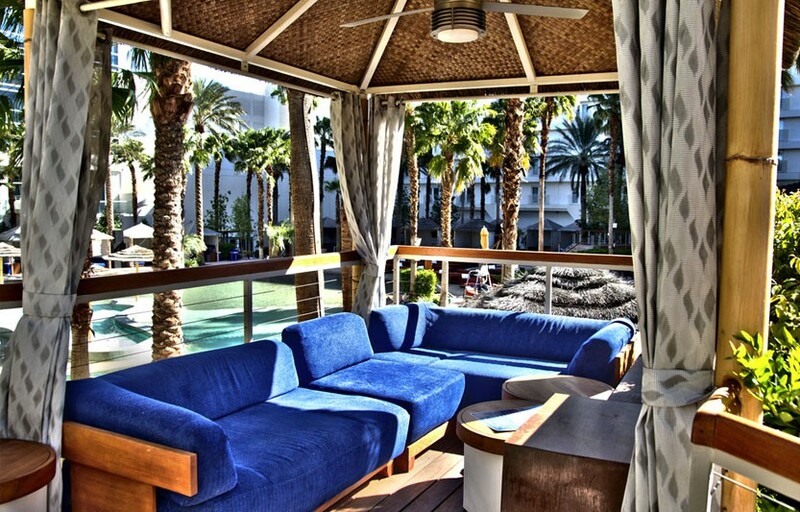 Rehab is located in the Hard Rock Beach Club at the Hard Rock Hotel & Casino. How much is cover charge / general admission at Rehab? Saturday: Ladies $20, Gentlemen $40, Sundays Ladies $30, Gentlemen $50. How long will I have to wait at Rehab? Average wait times are around 30 min – 1 hour, depending on what time you get there. Peak hours are 12-2. Rehab is open on Thursdays to Mondays from 11 AM – 7 PM. The pool at the Hard Rock is open the rest of the week as well, but not for a day party. What are the best days to go to Rehab? Sunday funday – the original Rehab pool party. What is the dress code at Rehab? Beach/pool attire. Swimwear is encouraged. How much do drinks cost at Rehab? Water $8, domestic beer $7, imported beer $8, domestic buckets of beer $30, imported buckets of beer $35, cocktails $16, bottles starting at $400. Rehab features local DJs and live performances by hip hop artists. What kind of music do they play at Rehab? Rehab is primarily a hip hop pool party, with a few exceptions for special events. Where can I find an list of upcoming events / DJs at Rehab? You can download the Discotech app to see upcoming events, get on guestlists, and book tables. You can also visit Rehab’s website for a current list of events. When does Rehab open for the summer? When does Rehab close for the summer? Rehab’s 2015 season usually starts sometime in March and ends in November. Exact dates vary year to year, depending on weather. We’ll post the events on our app as soon as they become available – check our app for updates! In which hotel is Rehab located? Rehab is located in the Hard Rock Hotel. Looking for VIP offers and comps at Hard Rock Hotel? Check out URComped.com to find a Casino Host at Hard Rock Hotel.